On the eve of Mitt Romney's visit to Israel, President Barack Obama signed into law a military aid bill for that staunch American ally at a much-publicized White House ceremony that highlighted the political advantages of incumbency. 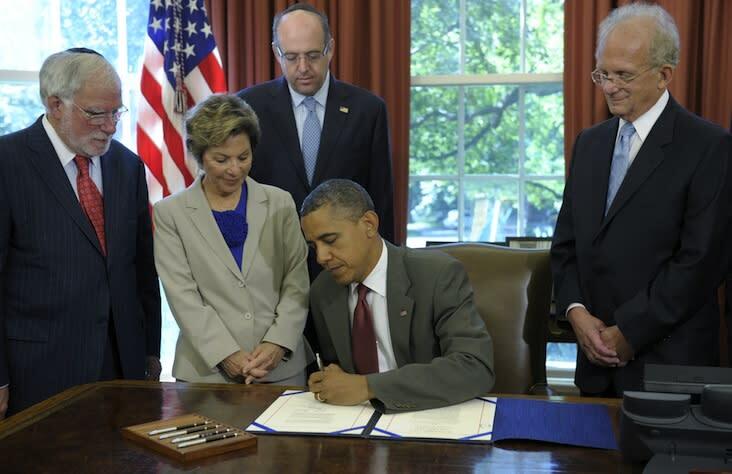 "What this legislation does is bring together all the outstanding cooperation that we have seen, really, at an unprecedented level between our two countries that underscore our unshakable commitment to Israel security," Obama said as he signed the measure at his desk in the Oval Office. The president also announced he would speed another $70 million to Israel to advance the so-called "Iron Dome" short-range missile defense system, a response to sustained rocket fire from Palestinians in the Gaza Strip. "This is a program that has been critical in terms of providing security and safety for the Israeli families," he said. "We are standing by our friends in Israel when it comes to these kinds of attacks." The signing ceremony, a relatively uncommon event in the Obama White House, fit a pattern this week of the administration trumpeting relations with Britain, Israel and Poland—the three countries on Romney's trip overseas to polish his diplomatic credentials. "I hope that, as I sign as this bill, once again everybody understands how committed all of us are—Republicans and Democrats—as Americans to our friends in making sure that Israel is safe and secure," said Obama. The president also deplored the "tragic" attack on Israelis in Bulgaria and said Defense Secretary Leon Panetta would shortly travel to Israel to "find additional ways that we can ensure such cooperation at a time when, frankly, the region is experiencing heightened tensions." That was a reference to escalating worries over Iran's nuclear program—and Israel's repeated warnings that it cannot tolerate a nuclear-armed Tehran and may resort to military force. While abroad, Romney has muted his usually sharp criticisms of Obama's handling of U.S.-Israel relations. A spokeswoman for his campaign welcomed the new law, but hit out at White House press secretary Jay Carney over an awkward, cringe-inducing exchange during his daily briefing on Thursday in which he declined to say what Israel's capital is. "Gov. Romney has long called for enhancing security cooperation with Israel and is happy to see that steps are being taken in that direction," said the spokeswoman, Amanda Henneberg. "Unfortunately this bill does nothing to address yesterday's evasiveness from the White House on whether President Obama recognizes Jerusalem as the capital of Israel, which raised doubt about the president's commitment to our closest ally in the region." Recent public opinion polls show Obama with a commanding lead over Romney among Jewish voters—but less than his advantage over John McCain in 2008. And with both sides predicting a hard-fought election, neither candidate is writing off any potential gains. In a "fact sheet" on the signing, the White House underlined Israeli Prime Minister Benjamin Netanyahu's May 2012 praise for Obama's "ironclad commitment to Israel's security." "He rightly said that our security cooperation is unprecedented," the prime minister told the American Israel Political Affairs Committee. "And he has backed those words with deeds." Netanyahu, who was to play host to Romney on Saturday, has had a frequently tense relationship with the American president. In November 2011, Obama told French President Nicolas Sarkozy, who branded Netanyahu "a liar," that "you've had enough of him, but I have to deal with him every day." Obama's more conciliatory message got a boost from Israel's veteran ambassador to Washington, Michael Oren, who expressed "profound gratitude" to the president for signing the bill. Oren dubbed the legislation "the most comprehensive commitment on the part of the United States to the short- and long-term security of its unshakable ally, Israel." "The Enhanced Security Cooperation Act sends an unequivocal message of support to the people of Israel at a time of great uncertainty throughout the entire Middle East, and reminds the region of the unbreakable bond between our two nations," Oren said in a statement. The military aid bill sailed through Congress—just two "no" votes in the House of Representatives in May, a voice vote to clear the Senate last week. White House press secretary Jay Carney denied politics played a role in the bill signing. "The timing of the passage and signing of this legislation was not up to us, but up to Congress," he said.